For Minnesota Twins fans understandably filled with discontent after a long winter filled with snow, sun, and seasonal affective disorder, there’s nothing more precious than walking through the gates of Hammond Stadium and seeing their beloved boys in action. 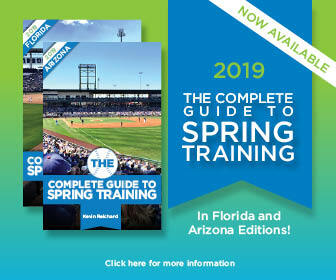 Out of all the sites in the Grapefruit League, Hammond Stadium may be the most beloved – if only because it presents a stark contract to the weather at home in March, historically the snowiest in Minnesota. CenturyLink Sports Complex in Fort Myers has been the spring-training home of the Minnesota Twins since 1991 and should be home to the team for the next 30-plus years (more on that later). It’s a facility that’s designed for the entire organization, with five full fields, two half fields, and a ballpark that also serves as the home of the Fort Myers Miracle (Class A; Florida State League) and the Gulf Coast League Twins. Hammond Stadium is an interesting ballpark, as it features a facade designed to invoke the feeling of Louisville’s Churchill Downs. And while it’s not in the most scenic of locales, Hammond Stadium does have enough little things to make a visit interesting even if you’re not a Twins fan. A large fountain and waterfall are located directly outside the main gates of the ballpark, while another fountain in right field entertains fans. The Twins have trained in Florida since their days as the Washington Senators: 1936 to the present (except for the war years of 1943-45, when the team trained in College Park, Maryland). Most of those years were spent training in Orlando — 1936 through 1990 — while their minor-league teams trained in Melbourne from 1964-1989. The minor- and major-league camps were combined in Lee County in 1990. The ballpark was named for Bill Hammond, the assistant director for Lee County who was a prime mover in attracting the Twins to Lee County. The Boston Red Sox also train in Fort Myers, while the Tampa Bay Rays train in nearby Port Charlotte. The Minnesota Twins/Washington Senators have held spring training in the following locations: Phoebus, Va. (1901); Washington, D.C. (1902-1904); Hampton, Va. (1905); Charlottesville, Va. (1906); Galveston, Texas (1907); Norfolk, Va. (1910); Atlanta (1911); Charlottesville, Ga. (1912-1916); Atlanta (1917); Augusta, Ga. (1918-1919); Tampa (1920-1929); Biloxi, Miss. (1930-1935); Orlando (1936-1942); College Park, Md. (1943-1945); Orlando (1946-1990); Ft. Myers (1991-present). The CenturyLink Sports Complex has been the home of the Twins for its entire history. Fort Myers has been home to several major-league clubs in its spring training history. Nearby Terry Park Stadium is possibly the oldest surviving spring-training field in Florida. It’s just east of Fort Myers and still heavily used by amateur teams. It hasn’t been used for major league spring training since 1987 (when the Kansas City Royals trained in Fort Myers), though it was used in 1990 by Twins minor leaguers. It was built originally as the spring-training home of the Philadelphia Athletics, owned and managed by Connie Mack.